Sterling Silver Dragonfly Charms, Dragonfly Pendants & Dragonfly Jewelry - When your jewelry designs require a Noble Metal. All Dragonfly Charms in this section are cast in Solid .925 Sterling Silver. These dragonfly bracelet and necklace charms come with a sterling silver jump-ring (unless bailed in casting or a jewelry component). Dragonfly is the power of light. The dragonfly inhabits two realms: air and water and the influence of both these elements will be felt by Dragonfly people. They will be emotional and passionate during their early years (the influence of water) and more balanced with greater mental clarity and control in as they mature (the influence of air). 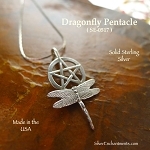 All Sterling Silver Dragonflies are Made in the USA.